GoFundMe is partnering with Deepak Chopra to launch a different kind of campaigns. The company is going beyond its usual role as a platform and hosting its own campaign to provide relief for government workers impacted by the current government shutdown. The company is partnering with several nonprofit organizations that are providing support to government workers. For now, GoFundMe is supporting #ChefsForFeds, an initiative that serves free meals in Washington D.C., as well as the National Diaper Bank Network to help parents impacted by the shutdown. Other nonprofit organizations can reach out to partner with this campaign. As of this writing, 1,170 people have donated over $94,000. It represents an average of $80 per donation. A couple of weeks ago, GoFundMe issued refunds for another campaign — a Trump-inspired campaign that wanted to raise money to build a wall on the southern U.S. border. It was operated by an individual and ended up with over $20 million. GoFundMe refunded backers as the campaign administrator wanted to change the terms of the campaign so that backers wouldn’t be able to get refunds. Once again, GoFundMe’s role is unclear. Many individuals use the platform to pay for medical bills and compensate the flaws of the healthcare system in the U.S. 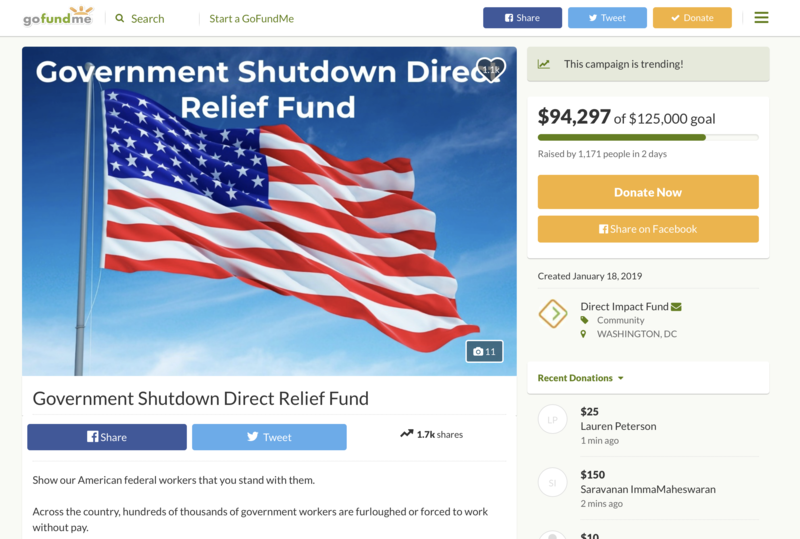 This time, a GoFundMe campaign is taking over during a government shutdown. In other words, a private company is managing the budget of government workers, or at least their most essential needs. GoFundMe can’t evenly cover the needs of all government workers across all states. Some will see a direct impact from that GoFundMe campaign while others won’t see any of that money. That’s the role of the government.